Is a camera to match the 12-35mm 'X' lens on the way? The new X lens from Panasonic is weatherproof... is a body to match on the way? One of the key features of the new 12-35mm premium 'X' lens from Panasonic, is that it's weatherproof and dustproof, however there are currently no G series bodies which also boast the same qualities. 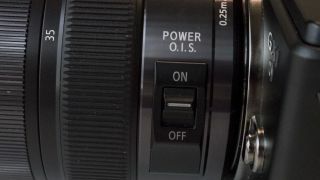 Last year, Olympus announced a new weather and dustproof 12-50mm lens towards the end of the year, that was followed up by the OM-D in January, which, surprise surprise, was equipped with dust and weatherproofing. Could its Micro Four Thirds cohort, Panasonic, follow suit with its own line-up? Asked by TechRadar, Barney Sykes from Panasonic UK said he was unable to say anything in relation to any future launches, but didn't deny such a development. Panasonic recently introduced the GF5, and update to the GF series of entry-level compact system cameras less than 10 months after the GF3. However, other lines in the company's range have not been updated in some time, such as the GH2, first introduced in 2010. Some also expect a replacement for the G3 to be announced soon, while the GX1 although only announced in November could also be a potential area for a quick upgrade if it follows the same pattern as the GF series. Speaking about the two-year-old GH2, Sykes said, "Sales have just picked up in the last few weeks, actually. Of course, there's always improvements we can make, we're watching things like the Olympus OM-D and Sony NEX-7, and the new technologies that those cameras are bringing." Rumours have suggested that July will see Panasonic make new announcements. Meanwhile, with Photokina coming up in September, it looks set to be an interesting year for camera manufacturers, so watch this space for more as it develops.